Creating a sports blog is a great way for fans to voice their opinions, share their knowledge and build a community of like-minded people. While any sports blog should be passion-driven (at least any successful blog should be), that doesn’t mean you can’t make money from it. 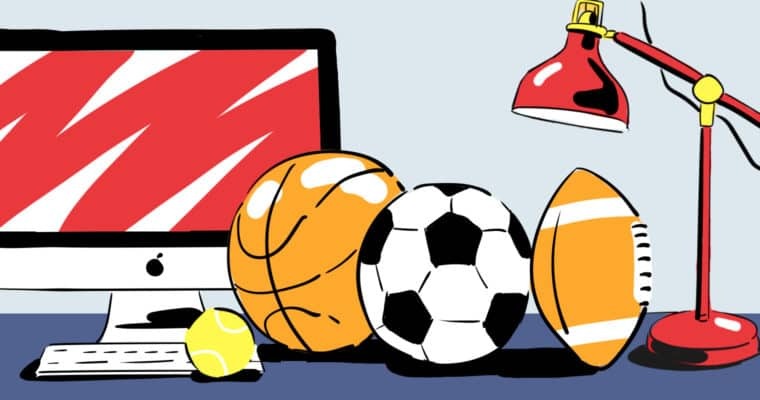 Here is a step-by-step process into setting up your sports blog and a look at how you can turn your sports passion into profit. Before you do anything else, you need to know what you are going to talk about. This should be quite straightforward: after all, if you’re starting a sports blog, chances are you have an interest in mind. New bloggers are always advised to “niche down” and find a super-specific target in an attempt to corner a certain market. There is truth to that, but you should focus your sports blog on what you enjoy and have knowledge about. If that happens to be something well covered like the NFL or Real Madrid, then so be it. If you don’t follow your passion, sooner or later you’ll quit. You have your topic, now it’s time to get set up. There are many different blog platforms to choose from, with the most common being blogger.com, Wix and WordPress.com. Once you’ve chosen which platform to use, spend a bit of time testing out different templates and designs. Want to know more about blogging platform options? Here’s a great guide. Pick a name: Don’t spend weeks tearing your hair out trying to find the perfect name. As long as it reflects your blog and won’t get you sued (avoid ideas that incorporate names of teams, players or leagues) then it will be fine. It will ultimately be your content that will define the success of your blog. Set up a domain: Now you know what your blog is called, head over to GoDaddy or Namecheap and register your name as a domain. Get a “.com” as it lends credibility to your blog. Design a logo: Don’t spend too much time or money on this, particularly when you are starting out. You will be able to get a clean, simple logo from Fiverr delivered within a few days. Social media: Engagement is key to the success of any blog and there is no easier way than to build engagement through social media. Setting up a Facebook page and Twitter account should be the starting points for a sports blog. For more tips on how to use social media to build your blog, check this out. Articles: The bread and butter for a blogger. The length of your articles will be up to you but a range of between 500-1000 words is a good place to start. Audio: The podcast industry has exploded in recent years. Get in on the act by creating your own. You could create a weekly monologue sharing your thoughts or set up an interview show. Video: If you’re comfortable in front of the camera, then video content would be a great avenue. Like your podcast, this could be just you talking to your audience or having a chat with a guest. You could provide content across all three platforms, but if you only feel comfortable with one then double down on that. Consistency is important so make sure you stick to a schedule. Commit to once or twice a week on set days, then increase your output once you are in the swing of things. Any sports blogger just starting out should be focused on content and building an audience – the money will come once you have steady traffic and a strong social media following. But here are a few ways you can profit when the time is right. Sell merchandise: This is not something you’ll want to do until you’ve built up quite a large following, so hold your horses for now. Still, selling relevant merchandise is a great way to make some income. Advertising: You will need an audience (around 10,000 unique visitors per month) to attract advertisers, but once you have that, advertising will not be difficult to acquire. There are numerous sports betting websites that would jump at the chance to advertise on your blog. Affiliate marketing: If you review gear or recommend products, affiliate marketing is a way to make some money. Sign up to Amazon Associates or any other popular affiliate program and when someone clicks on the link and buys the product, you get a percentage. Membership: A members-only section where additional content, special discounts or exclusive competitions are offered for a monthly fee is a brilliant way to bring in a steady stream of income. But always make sure you over-deliver! Hope this post inspires you to create a sports blog. Something you can be proud of and of course would be able to make money for you.